Just published! 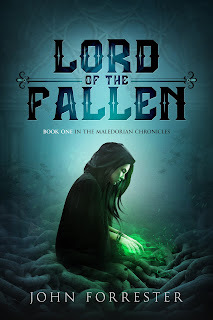 Book 1 in the Maledorian Chronicles fantasy series, Lord of the Fallen, is now available on Amazon! "Lady Elendria witnesses the murder of a boy and discovers it is connected to a cult sweeping the city of Criswall. The cult worships Ba’al, an ancient god named the Lord of the Fallen by the city’s poorest. The cult aims to overthrow the Kingdom of Mar Thagroth and bring back an ancient empire ruled by sorcerers. Forced to leave her childhood home a year ago, Elendria has adjusted to college life filled with people she once considered enemies. She is thrust into the court of King Galeran and attracts the attention of Prince Jondran, the king’s grandson. She is torn between her hatred of the kingdom and her growing interest in the young prince. While investigating the boy’s murder, she discovers a dark secret about her father. Set amidst a city rife with cultists and a class war, Elendria must choose between family and her new friends. But she soon realizes the choice is really between doing what is right and pursuing revenge."